One of the key hallmarks of a successful chapter is how well it is managed. Teachers should consider the SkillsUSA chapter as the training ground for students to learn personal, workplace and technical skills. A chapter only exists to provide rich experiences that prepare students for career success. To make that a reality, students must be the ones organizing and leading the chapter at the advisement of their teacher, known as the advisor. Mirror the chapter meeting by holding it once in the morning and again in the afternoon so that students can be involved in one of the meetings. Assemble the chapter members for a large group meeting in the cafeteria, commons area or gym, and then schedule committee meetings for smaller team work on projects. Conduct chapter meetings either before school or after school on a regular basis. Gather the group for a virtual meeting using a webinar or similar setting. Meetings are where the work of the chapter is accomplished and decisions are made by the members. The Sample Meeting Agenda will help you to understand the flow of the meeting, and the Membership Interest Survey serves as a great tool to determine the interest areas of members. Elect chapter officers and provide training. Chapter officers are essential to the success of a local chapter. They will conduct executive council meetings to plan for full chapter meetings. Officers serve and guide the membership and ensure that all members are actively participating. The steps to establish a quality chapter officer team are simple. a. Follow a step-by-step process to elect the officers. b. Ensure that all candidates understand the officer roles. c. Provide training for newly elected officers. How many members will be represented? Will each school program have an officer team, or will there be one officer team for the entire school? Will the team be representative of all programs? What structure do members desire to have? Is it in line with the chapter constitution and bylaws? Ensure the candidates fully understand the duties of the office for which they desire to campaign. A number of resources are available to help students understand the different roles and responsibilities of each office (SkillsUSA Leadership Handbook, Leveraging Your Leadership with Effective Chapter Meetings and Officers and Elections Training Module). Within the election process, all candidates campaign for their desired office. Campaigning provides a great opportunity for personal and workplace skill development. Procedures must be fair for all candidates. Establish rules and guidelines that all candidates follow. This may include completing an application, writing an essay on why they would make good officers, teacher recommendations, an interview and including speeches as part of the campaign. Additional guidelines may include requirements to maintain a specific GPA, proper behavior and a spending limit for campaign materials. All chapter members are eligible to vote in the elections. Consider establishing an election committee so they can determine, prior to voting, the most appropriate balloting procedure. Options can include one vote per member or determining a percentage that candidates will be awarded from their essay, interview, speech and ballot count. After election results are determined, install officers. Use the long or short version of the installation ceremony listed in the SkillsUSA Leadership Handbook. Officer installation is an excellent time to involve members and their families in your chapter as well as school administrators and community leaders. Training ensures officers understand and are capable of performing their duties effectively. Some ideas for training topics include: roles and responsibilities, working as a team, meeting basics, creating an agenda, use of committees and how to make meetings fun for attendees. 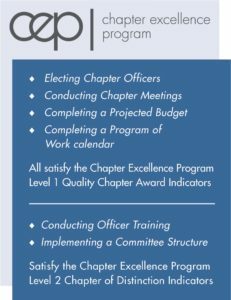 Consider purchasing Leveraging Your Leadership with Effective Chapter Meetings, and in six lessons, your officers will be able to plan an agenda, organize and run a meeting and operate committees. Selecting activities that are meaningful to the students. Establishing a chapter calendar to be used as a plan of action for the year. Evaluating chapter progress to ensure continued success and improvement. 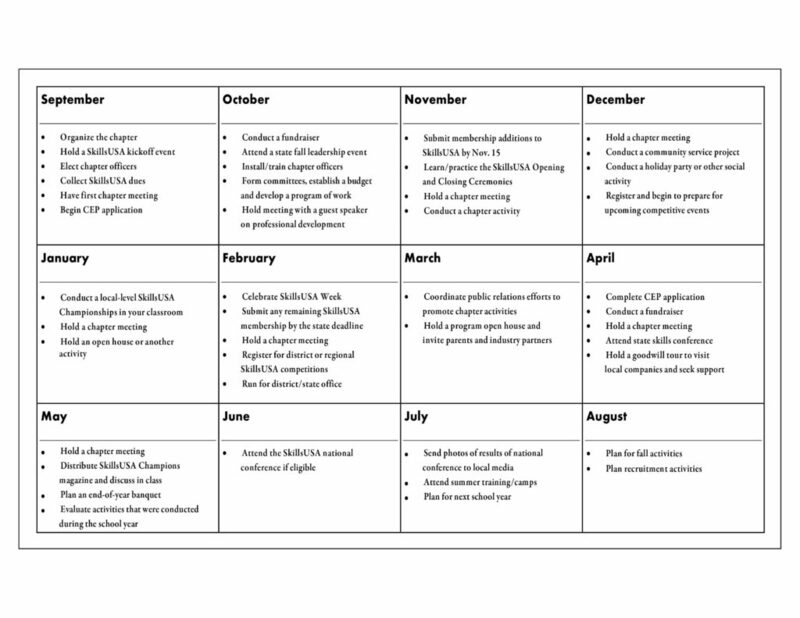 After you have selected the right activities for your chapter, you can begin compiling a chapter calendar to serve as a plan of action for your SkillsUSA chapter. As students begin planning, encourage them to make certain the calendar includes at least one activity from each of the seven keys for the SkillsUSA Program of Work. Click image to download sample calendar. Committee of students or officers select a chapter activity. They determine which SkillsUSA Framework Essential Elements best apply to the activity and provide an opportunity for intentional learning to take place. Select two to three Essential Elements from one area of the framework: personal, workplace or technical. As a committee, write three SMART (specific, measurable, attainable, realistic, time-bound) goals for the activity that include how members are going to gain the Essential Elements of the framework. Create a plan of action (who, what, when and where) for completing the activity. At the end of the activity, revisit the goals. Prepare a statement that includes results, evaluation and how students achieved the developing framework skills through participating in the activity. Consider what was accomplished? How did this activity help members gain skills based on the Essential Elements selected? Complete a projected budget that includes a list of planned income and expenses for the year. Within the planning process, it is important for students to consider if an activity falls within the budget and can be supported by the chapter. Creating and following a budget ensures the success of a chapter but also builds key skills among the members such as responsibility, decision making, planning, organizing and management. Developing an understanding of sound financial practices is a skill that will carry over into a lifetime of success for students and ensures career readiness.